This is Lord Sananda. Thank you once again for being with us. It is my pleasure to be your host and spokes-being for the Christ Consciousness. I so look forward to these times that we are connecting. It is a beautiful exchange and it helps each of us to connect with each of you more deeply than you ever could realize. Tonight is a Heart opening night as Meleriessee was explaining. I want everyone to breathe deeply within our Heart Center. We’re going to open up that emotional frequency this evening as we allow those areas that have been lost in a deepness core of your Lotus Heart into the Chamber of the Heart Chakra. There may be elements in there that you are not aware of that are going to come up. We’re going to allow the vibration of the energies to take hold. Tonight is preparation. Preparation again, once again, preparation seems like were doing a lot of preparation in this last few weeks. We would like you to be fully aligned with your Soul’s purpose, and not everyone is going to feel the intensity that others are may be feeling it. Whatever pathway and whatever incorporation you are bringing with you forward in this time is where your supposed to be. So I ask each of you in this moment to open up your Heart. Would you like it to be wider than it is now? Would you like elements to come more fully within your life? Let’s take a breath and think of five elements that you would like to change within your life. First, let’s get an idea of what we are looking for this evening. I want you to take five elements that you may be holding onto, and maybe there is a blockage within your life, or maybe you don’t even know there is a blockage. What if you wanted a relationship so badly, and you know someone who wants this relationship also, but that person is not ready to open up their Heart to you? What if you are thinking you have your Heart open to them, but there may be a pocket blocked away that is not allowing the energy to come into your Being, because it could be the most powerful relationship you have ever experienced in a physical sense that is overwhelming because of the higher frequency. What if you receive the funds that you are looking for to fully give you freedom, but a part of you is afraid to receive those funds? You want them, you want them desperately, but what if it is so deeply seeded within you that it would completely change your life. What if you are desiring change, so deeply, yet within that change you are not quite ready to uproot yourself? These are the elements that we want you to look at that may be holding you back from your full potential. It’s going to be different for each of you. If you don’t have five things that you totally need to move into, that’s quite alright, we’re giving you the choice of five elements this evening to fully release. What we are doing is preparing you for the Lunar Eclipse and Full Moon. How is this going to happen? Well this energy that is coming up in this next week is about expansiveness and balance. So how can we be expanding our frequency, if we don’t have total balance within us? So what that is going to happen is that it is going to bring up those elements that are not quite ready within you to be released? And, when I say not ready within you, I’m not talking about your Heart Center, I’m not talking about the Mental level, I’m talking about the cellular pockets that are deep within you at the core of your Essence that you have been holding onto for eons and eons of time. You have been going through your pathways in a certain manner, you come into body, and take on a creation that your Soul Monad is guiding you through the Rays of God as you are attuned to the Rays of God within your Soul and your Monad. This really develops your personality and how you are interacting in your Physical body, your Emotional, and your Mental. This evening we are going to open up that Heart Center with love and compassion and beauty of the Divine Mother. It’s going to be a different night for everyone. The combination of the Divine Mother and the Divine Father God will come through but most of the energy will be centered upon the Feminine Divine within each of you. We want you to fully embrace your Heart and your expansiveness as you never have before. So I sit here, in this moment, within this woman to share with you, the development of your Soul’s Essence fully embodied within your physical as we have been assisting you with previously. We help you, each week with these activations, because little-by-little each of you are getting it, allowing it to happen, you’re wanting it to happen, and now the time we are going to come to the culmination of the development as you allow yourself to expand in the most beautiful way possible. Let’s take a deep breath. Within that deep breath, I want you to open up your Heart Center, and deep within that Heart Center we are going to bring in the frequency of the Pink Ray. Allow that Pink Ray to come into your Heart Center in a clockwise manner and as it comes in, it’s like a funnel of light. A funnel of light that is going to fully come into your Heart and it’s going to open up the Heart Chakra Canal. See all the elements within there, breathing deeply with that. Allow that essence to be totally within you. As you bring forth that Deep Pink Light, feel the compassion and love as the activation can occur now. Allow all the old elements to be released, there is no longer any reason to hold on to them. Let’s take a moment and use the Bowl, to fully feel this frequency opening up, allowing this chamber to open up as you never have before. Breathing deeply, feel that frequency of the Pink Ray coming deeply, deeply into your cellular structure. Feeling the essence of the compassion, and the love, and knowing what to do in the right moment, with the activations, and your manifestations fully actualized. Allow that to flow into your Heart Center. As it flows into your Heart Center, it’s now going to go into your cellular structure. Beyond the physical and into all those elements that hold the Soul’s Essence, the remembrances. All remembrances, we’re going to ask that all remembrances to be open at this moment. Good, and bad, and indifferent, because all is being enveloped within the Pink Ray of love and compassion. Feel that very deeply into you now. Allow it to go into all parts of your body that maybe holding different areas, maybe there’s some in your joints, your muscles, your neck area, your Third Eye. Do you have sinus problems? Do you have throat problems? These are all part of a cellular level holding on to those fragments, bits and fragments, allow yourself to just breathe through it. It doesn’t have to be a physical reaction,it can be an emotional reaction, or a mental reaction. We want the mental body to fully relax. So we want the male energy, the yang that is part of you, to fully just sit back. Sit back men, and allow that frequency on your right side of your body flowing through you, and just relax and allow this pink flame, this beautiful element of this light. There is nothing that can stop you in this moment from embracing the purity in the essence that you are, because there is nothing else. As we blend with the physical, and the emotional, and the mental, we allow all those elements to accept this divinity that you are. Allow it flow through you. Now we’re going to ask for the Christ Consciousness of the Gold flame, the golden color to come into the heart of that 4th dimensional chakra grid. Allow that to be enveloped within you. Because with the pink and the gold there can be no other existence, this is your existence of your Christ Consciousness. The beauty that is you – the aspect of your being within you – to fully accept in these physical bodies that you are a body of light. That you are a master walking into this body, and allow any thoughts that have stopped you previously to now be removed. We ask that any emotions that have stopped the flow, and we ask the tears to flow this evening, we want to open up those tear ducts in every one of you. Not just the women, we want the men, we want the divine feminine aspect that is part of your being to flow through you, to embrace your heart center, and the purity that you are. It’s going to assist you in activating your thoughts, it’s going to assist you in activating your relationships, and the love that your embodying. I previously had mentioned five elements, let’s now take the time to feel these frequencies coming through you. We’re going to give a couple of moments and I want you to state to my being, to the I AM presence of the cosmic level, what it is that you fully that you desire and command, and give it to your own I AM presence, because we all speak within the oneness in this moment. Allow yourself to be in the receiving mode with this frequency in this moment. I AM Lord Sananda at your service. Embrace the Beauty and the Love that is about to be incorporated into your being. We are happy to be here in this moment to assist you with this activation. Namaste. Let us take a deep breath, and within that deep breath, let us feel the male and the female, the God and the Goddess within, the Yin and the Yang, the male and the female, and allow that balance as we come to you with the balance of the male and female of the cosmic great central sun, the Divine Mother and the Divine Father God of the union that we are together. Breathe deeply as you receive the activation to allow you to accept. The Divinity of your Feminine Aspect to be fully activated within your heart as you do that feel your male energy slowly relaxing. Allow the right the side of your body to be in a state of receiving. Allow the left side of the body to be in the receiving mode also, but also to remove and release all elements for eons of time of your souls history to be fully removed and to accept your divinity of your light. Breathe deeply. As we now bring in this frequency of light. I Am the Divine Mother in the Divine presence of the Feminine aspect I bring forth to you in this moment your own divine feminine aspect that has been lost within the body, it is not lost within your souls essence, it is just lost within the physical, let us open up our hearts, let us breathe deeply through these moments, and allow this pink flame to be activated in a way that has never been activated before. Breathe in the essence that you are, breathe in the essence of your becoming, breathe in the essence of your origination of your divine frequency, breathe in that frequency and allow it to come fully within your heart, and feel the essence of this beauty, that is you. Feel it spiralling down into your crown as the flames are intertwined with each other, through the third eye, deeply into your chakra system. Into the throat and the thymus feel the thymus and the warmth of the flame, feel the heart accepting the love, allow it to go deeper into the lower chakras. Let it burn away all aspects that no longer serve your pathway, serve your existence. Breathe through that in your sacral. Allow all the sexual energies of your past relationships to be fully removed. Allow the pathway of Divine aspect of your being to be activated, as now the flame is in the root. Allow the flame to burn away all anxiety , all lower energies, all lower vibrations that are no longer a part of your existence. As the flame goes deep within you, it opens up your chakras and now we attune you with the 4th dimensional chakra grid, feel those chakras being activated now, allow your thymus to be in the warmth that your higher self is now accepting your divinity within the physical body. We now bring the Gold of the Christ Consciousness as the chakra column has now widened. We have opened up the central canal the fluidness of this golden light blending with this pink light is amazing element to foresee. Breathe deeply through the aspect of your being. Let it go to those elements that you have stated to your I AM presence that you want to activate. All the blockages, all the thought process that have stopped you from fully actualizing these elements within you, letting go of any fear, letting go of any wonderment, allowing yourself to be in the moment, and just accept the magic that is coming to you, as the divine feminine is being fully activated within your heart. We now bring forth the energies of the magenta of the heart, as the solar plexus, and the heart, and the thymus, are all one chakra on the 5th dimensional chakra grid, feel your chakras blending within each other, of all colors and no colors, and allow this frequency to be fully within your cellular structure. It is like twinkling of light, sparkles of light, just going to all the areas that need to be healed. Let us breathe through that. As the Divine Mother God I embrace you with my light, I embrace you within nurturing that is deeply needed in your Heart. Let it come into you. I now command that each of your hearts fully expanded, that each of you receive the love that you desire. That you walk upon these pathways, that you find your Twin Flames, and you allow yourselves to be embodied with Twin Flame energy. We remove all judgments, we remove all thoughts, we remove all blockages that have stopped you previously. But you must stay in this center, you must stay in this frequency, you must stay in this Essence. Breathe in the Essence, and I ask that every individual that has put out their commands of what to create in the five elements is now being activated during this Full Moon of June and the Summer Solstice. Feel yourself walking up the mountain and right now it feels like it is a very challenging pathway, but it is not. Allow this frequency that is part of your divinity to be fully activated within your body. It is your time to show this to others, men show your heart unto the women, women show your innocence onto the men, allow each to come together as the balance occurs within each of you individually; you will create the balancing relationship that are necessary. Not only is this solstice about your pathway, but this solstice is about each of you meeting, the solstice is about the soul families. The solstice is about your 144 soul extensions of your Monad and your I AM Presence, this also has to do with the frequencies of your Twin Flames. It is an active movement onto the Twin Rays, it will be activated on a 5th dimensional level of the New Earth on Terra Christa, but this is the pathway that is necessary at this time. Embrace these elements coming into you! Breathe deeply through all parts of your being! Breathe deeply in the essence that you are! Accept it as it is, accept your life circumstances now being changed from this moment forward, this is the activation of the magic of your heart. 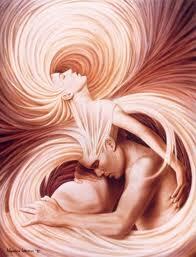 I bring to you the elements of the pure essence of the Divine Feminine within you! I stand before you, and I have my palms with these beautiful balls of light, take them, and put them into your Heart. And then hold your hands to your Heart, these are little pellets of love that are going to expand within you, allow it to grow into your Heart Center, and as it grows into your Heart Center it will grow into the other parts of your body, but it must start within your heart first. You must share your expression to others! Allow yourself to know that it is time for the communication to be fully open with others. Do not stop because of your fear, Do Not stop because you are afraid it will not be accepted, that no longer matters! What needs to be done right now is the full Essence of your embodiment. Allow yourself to come together with these beautiful beings of light. And, no, it is not a sexual experience, but it is a sensuality that you embrace deeply within yourself first, and then you will share it with another. It must come from your higher consciousness, and we bring it now into your physical body. O, Holy God of Hosts, I Am the Divine Mother God to bring forth the acceptance, I take my arms around you and I hold you deeply, as your Male and Female is now intertwined within you, allowing the balance to occur; feel the Acceptance of your God and your Goddess self coming together in union and then emanating it out of your body. You are a mirror for all of this to occur, allow the magic to be within you as now you walk in balance, and you accept the Divinity that you are, not what you thought previously. Get out of the mind, it will not help you. Take another deep breath, as you feel the Magenta within your Heart, Solar Plexus, and your Thymus, and take that Vibratory Communication of the Violet Pink Light in your Throat and share with others. Allow this Vibratory Communication to go through the elements of the frequencies and share it with others, through the essence of not necessarily in physical words but in the interaction upon the Grid of the Light of the Cosmos as we’re all interconnected with each other. Allow yourself to receive the acceptance that is happening, because as you receive the acceptance of these frequencies, it will be manifested into the Physical. But not within your Physical 3rd Dimensional Body. It will come in the higher frequency, it may happen to you when your going to sleep, in your sleep state or meditation, but when you awake ~ know that it is true! We now embody, we are now one with the Divine Mother the Divine Father God to bring forth these frequencies within you to show you the balances that are about to occur, but you must work with it, and allow yourself to feel more than you’ve ever felt before. Embrace the Light, embrace this Frequency! You are within one of balance within you and then it will mirror out, outside of you, as you communicate with the Vibratory Communication these frequencies will come back to you. Know that what you are feeling is an acceptance of your stability, an acceptance of your light, as you never have received before, and if you are unsure how this is going to happen physically, know it may not be your time but it is coming! Allow the communications to happen on the higher frequencies and you will be able to communicate with those you are connected with in many different ways, it is now at a time where you are not so fully activated with people on the physical sense, as in the physical eyes, physical hearing, and the physical mouth, you will be the sensory activation of your love for others in a completely different manner. Don’t try to figure it out on the physical level, allow your Higher Mind to embrace you! Let you Higher Heart accept it! Breathe deeply, it is our pleasure to bring forth this energy this evening, it is a beautiful occurrence that is about to happen on this plane. Holy God of Hosts That We Are, Holy God Of Hosts That We Are, We Are One, We Are One With You As You become One with Others! Holy God that we are, accept this frequency of Light within you; the magic is about to enfold within your Being. We are the Cosmic Great Central Sun, The Divine Mother and the Divine Father of God! Allow this activation to be fully within you, in this moment, and in all moments forward. We embrace you upon this time, as this beautiful experience that has happened as many are opening up their hearts to many others. In the name of the Holy God of Hosts of YHWH and all That Is In The Source Of Oneness, Be at peace with these activations of balance within you! Greeting, this is Lord Sananda, Once again, thank you for accepting these energies. Continue with these frequencies through the Full Moon, and up to the Solstice, they are going to assist you tremendously by embracing the Light that You Are. It is my honor and pleasure to be the spokes-being of the Cosmic Oneness bringing forth the Christ Consciousness but also to walk with each of you.